Where is the maths in these Case Studies? 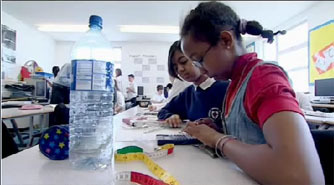 It is not always easy for pupils to see any connection between the real world and mathematics lessons. As a result, they don't use the mathematics they learned in secondary school, even though thinking with mathematics could help them understand the world better - and to make better decisions. This module is designed to help you consider how you can integrate and develop these Key Concepts and Processes into your teaching. The videos were made possible by the hard work, patience and cooperation of the staff and pupils of George Green's school, Isle of Dogs, London. These modules will work best with a recent version of Internet Explorer (IE 10/11), Firefox, Safari or Chrome. IE8 or later should work (with some cosmetic issues) but will not be supported. The modules are video-based, and require a fast internet connection. Some institutional networks may interfere with the video playback. Alternatively, download the complete module from the link below when you have access to fast internet (the files are ~1GB) and run the module from your hard drive or a memory stick. PC Users will require Adobe Reader or alternative to view and print the documents. To run the software applets online, you will need Flash Player installed.